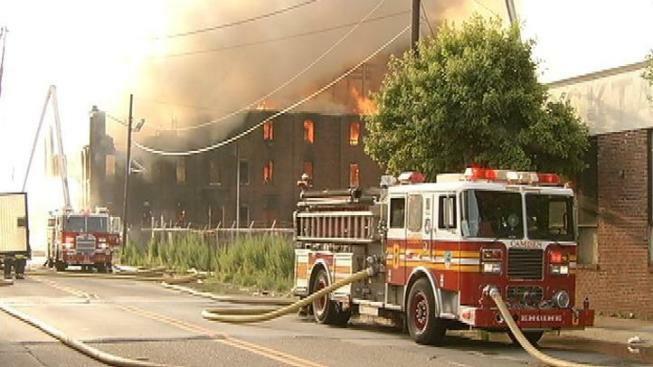 A fire that tore through an abandoned warehouse in Camden, N.J., on Sunday - the third major fire in the city this month - is now being investigated as a possible case of arson. The six-alarm fire started at 5 a.m. at the Concord Chemical Plant, a former factory that had been shuttered. Nearby homes were evacuated, but no injuries have been reported. Camden fire officials said portions of the warehouse had collapsed, but the fire was under control at 9 a.m. Sunday. Fire officials said a special task force had been created to look into the recent warehouse fires, and said that 17 vacant buildings had been searched and boarded before Sunday's blaze. According to officials, the recent fires may have been started by scavengers scouring the buildings for scrap. "This building has been reboard three times in a week," Camden Fire Chief Michael Harper told NBC Philadelphia. "So they board it up, somebody takes it off. So, we don't know what the problem is but we're trying to do everything we can to make sure these properties are secure." The former chemical plant was the site of a major EPA cleanup earlier this year. Although volatile chemicals were removed at that time, the building's history was a cause for health concern. Haz-Mat teams were on the scene to determine if any chemicals had been ignited in the fire. Also this month, a 12-alarm fire burned a former tire distributorship and several homes over two city blocks. It displaced 16 families, including 30 adults and 35 children. Efforts to fight that blaze were hampered because three nearby hydrants had been vandalized and were unusable. Three days after that blaze, another fire in a warehouse a few blocks away went to eight alarms. Neighbors said the building was frequented by drug dealers and prostitutes. "Obviously its unheard of for us to have these kinds of magnitude of fires, you know, all within a weeks time," Chief Harper said on Sunday. "It's very troubling to me; I'm sure they're going to get to the bottom of it."